New enchantment — Big Hole for shovels and pickaxes. Compatible with Silk Touch and another enchantments (it should be). You can disable one of in the config. Yes, with this your shovel or pickaxe (vanilla and modded too) will dig 3x3! With Shift key will disable this feature and the shovel will dig 1 block as normally. 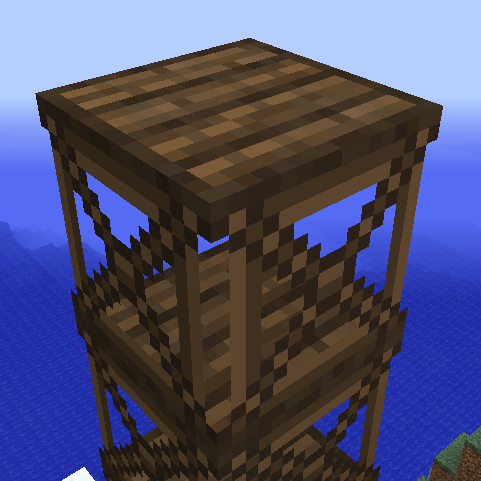 Scaffold like ladders and crumble if you break the bottom block. Right click with scaffold in hand will build scaffold on top scaffold's tower. You can use this mod in any modpacks without my special permission. The enchantment Big Hole doesn't recognize other enchantments such as fortune and auto-smelt in with the surrounding blocks that it breaks. Ores like diamond, coal and alike don't drop xp either when broken indirectly. I hope not. This is a pretty cool enchantment to have paired with silk touch as well and it would be a shame. Sorry, but I didn't foresee this. I'll try something with this. I've only tried it with the pick. Testing shovel now. Both shovel and pickaxe ignore the silk touch and fortune enchantment when indirectly mining blocks. Kind of disheartened that the enchantment for the pickaxe doesn't work with end stone and obsidian which is fair. It's perfectly balanced as it should be. P.S. Regarding xp, I think the blocks that provide xp and can be mined are ores. Only the pickaxe does the xp drop thing. Hm. Enchantement only for shovel. Vanilla pickaxe? Sorry, it's not a bug :) Thanks for feedback (use github issue tracker instead please)! Check new version, work now with Silk Touch and CoFH Smelting. Thank you. Sorry I forgot to fill this up in github. Will do next time. End Stone can not be shoveled, sorry. I didn't fully understand you. You can disable enchantment in the config, ofcourse. Can add a description of "Big Holes", so that more convenient for people to understand. Yes, I can try. Thanks! Check version 1.6 please. Done? Mouse over book, then push “shift”. Hmm, nothing happens to me. You also need a module "wawla". a) So, using a scaffold block on another one, will place a scaffold on the very top of that stack ? b) you can climb scaffolds just like ladders ? c) breaking the bottom block will drop all scaffolds on top of them ? if the answer is yes to all three of them, then i did understand correctly.